This past weekend we played in our very first tournament of the 2010 season. It was in Montpellier and it was great to get some game experience. Since we don’t have any points we had to play in the qualification tournament which was held on Thursday. We were in a pool of 3 teams and after a couple of matches, of which started off slow and took a bit to get used to playing again, we came out first in our pool. We had to play another match to qualify but this put us in a good position as we would play the lowest ranked team in the other pool. It seemed like we had peaked nearing the end of the day, having our best match and qualifying into the main draw tournament and play the next following day. On Friday it did not prove as easy as the day before. Since we were ranked last, again according to our lack of points, we were matched up in a pool with the number 1 ranked team. Our very first match was against them and it was a lot tougher than the previous day by far. Playing versus a solid serving team with good defense definitely tested our ability to rise to the challenge. Unfortunately we unable to meet it at this time. Our next pool play match we won coming 2nd in our pool allowing us to make it to the 1/4 finals. Our opponents for this playoff round was none other than Cecile Rigaux, a former French beach volleyball Olympian. I obviously didn’t know who she was until now. She is much older but still has the skill to make you run circles. I always say this “beach is like wine, you only get better with age” and it was true in this case. It was a good match, having a close game in the 2nd set and giving them a run for their money. We lost in the 1/4 finals and finished 7th overall. There is so much to take from this tournament. Every experience is a learning experience. This is just another stepping stone towards our goal. With more training and games under our belt, we truly believe we can be a force to be reckoned with, especially when we go to play in Africa. Our adventure to Montpellier was not only on the sand but off the sand as well. I guess this is all part of travelling and playing. I’m so grateful we made it to Montpellier safely. I don’t know much about cars but we discovered when we got there that the gear box was broken since the gears would not change. We were able to get to a garage that weekend and thought it was amazing that the mechanic was able to fix it on such short notice. When we took the car for a drive the next day it started making other weird noises where it had not been before. We took it in again and it turned out that the mechanic had not screwed in the wheels properly. The grain of the nut and bolt was now destroyed from all the friction that they now had to change the whole thing. We were stuck in Montpellier a little longer than anticipated but I’m glad we caught the problem before our return trip home. It might have been very dangerous driving on a loose wheel. It’s all part of the adventure I guess. This will be a memorable one for sure. 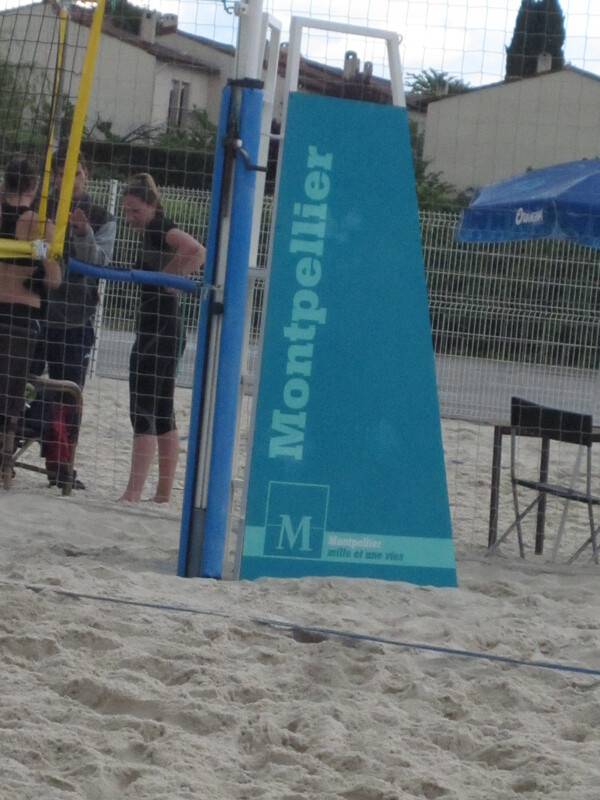 This entry was posted in Beach Tournament, Beach Volleyball and tagged Beach Volleyball, Montpellier. Bookmark the permalink.